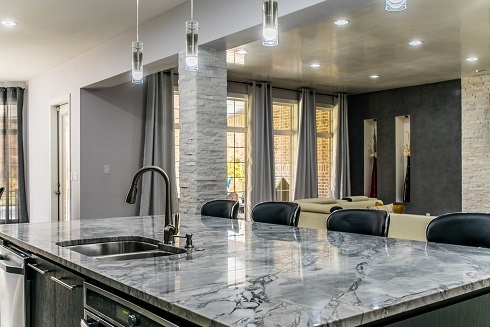 When it comes to natural stone countertops in Chattanooga, Tennessee, there is no other material on the market that can mimic the luxury or sophistication that marble is so well-known for. Chosen by architects and builders for centuries for this stones impressive durability, it's easy to see how this natural stone has remained so popular for hundreds of years. Featuring a stunning color palette, patterns, and custom options, creating your dream space couldn't be simpler. Known for the sophistication and opulence, marble countertops are true works of art made by mother nature herself. Marble features impressive versatility and can be used in a number of ways—from countertops and vanities to flooring, fireplace surrounds, and even outdoor spaces. This natural stone can be used to create a dramatic, stunning centerpiece that will leave your guests talking long after they leave. Marble countertops can also be used to create an elegant, peaceful retreat to escape the long day! As you consider your countertop options for your remodeling project in Chattanooga, marble should definitely be on the list! Marble is classified as a metamorphic rock and can be found in numerous regions all over the world. This natural stone is formed from limestone that has undergone recrystallized carbonate materials that are found beneath the earth’s surface. Typically, marble is formed as limestone and various other minerals are subjected to intense pressure and heat through metamorphism. Some of the most common materials found in marble includes sand, iron oxides and clay. Marble’s color and veining patterns are directly related to the specific type and amount of minerals present during formation. For instance, marble that has a green hue with serpentine patterns would have formed in a region with a high magnesium content. Once the stone has been fully mined from a particular site, it can never be reproduced or replicated again. When you choose marble countertops for your Chattanooga project, you can expect to benefit from a number of advantages. Aside from being stunningly gorgeous, marble offers an array of features and characteristics that shouldn’t be overlooked. If you aren’t quite convinced that marble countertops are right for your countertop project in Chattanooga, here are some additional benefits of marble that may help you decide. Heat Resistant - Marble countertops are extremely heat resistant as a result of the metamorphism process. This means you won't have to worry about hot cookware or hair styling implements damaging your stone. Inherently Cooler Temperature - Marble maintains a naturally cooler temperature than the surrounding environment. That’s what makes this stone the perfect surface for rolling out pastry and dough. Design Flexibility - This natural is stone is softer than other countertop options like granite and quartzite. This makes marble the ideal choice if you are considering custom fabrication, specialized shapes, and unique edging options. 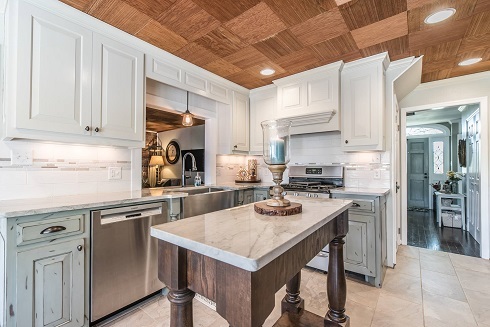 Added Value - Marble countertops are a great way to see the best returns on your investment. If you ever decide to sell your home, these high-end features will appeal to a wider range of potential buyers and may also prompt higher offers from serious buyers. Marble countertops in Chattanooga, Tennessee are the perfect choice for anyone who likes to bake. Due to the cooler nature and natural resistance to heat, marble countertops provide the perfect combination of performance and beauty. Best of all? With a little extra care and maintenance, this stunning stone will continue to provide impressive durability and performance for years to come. Marble can be found in a bevy of beautiful hues with a palette that’s bold and plentiful. No matter what your style or taste, you can be sure to find the perfect complimentary color to match your vision. From opulent blacks and brilliant whites to pastel pinks and brilliant blues, the color palette of this natural stone is simply unrivaled. Marble colors and patterns are ultimately reliant on the specific region and quarry from which the stone came. Each quarry around the world has its own unique blend of natural minerals that help to create each stone’s unique color and and pattern. Marble quarries can be found in Russia, Italy, Ireland, India, North America, Greece, Germany, and more! Chattanooga, Tennessee marble makes turning your dream space into a reality easier than ever. With a sleek, sophisticated look and feel, this natural stone shatters expectations. Known for its natural luster and ability to last for centuries, marble kitchen countertops will bring a sleek, upscale feel with unrivaled performance to your kitchens, both indoor and out! Marble countertops offer unmatched, luxurious beauty combined with superior performance that simply cannot be reproduced by man or nature. Marble kitchen countertops in Chattanooga are absolutely stunning whether you have them installed throughout your entire kitchen or as an accentuating piece to showcase other high-end features. If you absolutely love the look and feel of marble, but aren’t sure if this stone is well-suited for your kitchen - bathroom marble countertops are the perfect alternative! There’s no denying the warmth and timeless elegance that marble can add to any space. This stone comes in a wide array of hues and patterns - so you can be sure you’ll find the perfect stone in a complementary hue to match the design, style, and decor of your new kitchen in Chattanooga. Contact Us - Simply provide the details of your project so that we can personally assign you a Design Specialist. You'll get an estimate for your Nashville marble countertop project within 24 hours after you contact us. Your Specialist will work with you for the duration of your project and serve as your single point of contact for a more personalized experience. Choose Your Stone - Your Design Specialist will guide you through the selection process, taking as much time as you need, helping you to choose the perfect stone and edging for your project. Our Visualizer Tools can help you see exactly how a particular stone will look in your space. Schedule Your Templating - Our experts will visit your space and meticulously measure everything. You can expect fully installed and functional marble countertops in Nashville within 5-7 business days after your templates are made, guaranteed. Stone Fabrication - This is when we fabricate your stone and edges. After cutting, your stone will pass through several quality inspections before being approved for installation. Our fabrication process for marble countertops in Nashville, Tennessee has one of the quickest turnarounds compared to our competitors. Installation - Our expert installation team will arrive on-time and install your gorgeous new marble countertops in Nashville, Tennessee, professionally and efficiently with as little inconvenience as possible. We know what a stressful experience a poorly-run remodeling project can be. That's why we remain committed to using our knowledge and expertise to help you throughout the entire project. 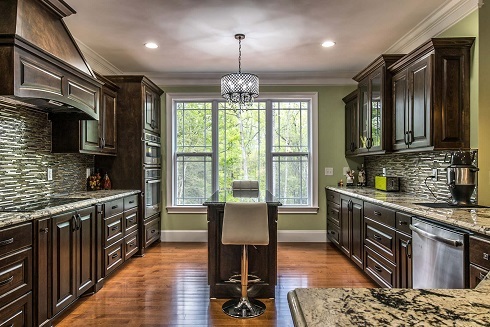 Granite Empire and our entire staff are eager to share our passion and help you to turn the kitchen or bath of your dreams into a reality with gorgeous marble countertops in Nashville! Contact Granite Empire, or simply stop by our showroom, and speak with one of our friendly professional specialists today. We can't wait to hear from you and answer any questions you may have about quartz, granite, and marble countertops in Nashville, Tennessee . We can also schedule your no-cost, no obligation marble countertops consultation today and help get you started on your new dream space today!